Here we have a new street-legal supercar from the house of French maker. Yes Bugatti began its Veyron journey back in 2005 and before bringing the successor to this series it seems like they are in mood to enthrall the world of supercars with their powerful engines, unique designs and one or the other new clicks they get. This time it is with Bugatti Veyron Grand Sport Vitesse 1of1 2014. Let us have a closer look and a descriptive know-how of this new release. Interior of Bugatti Veyron Grand Sport Vitesse 1of1 2014 is created with its classic black and yellow theme; trimmed in black leather with yellow stitching over steering wheel, seats and gear selector lever. To keep the legacy alive between the seats and over the carbon-fiber lid, Bugatti has embossed a sketch of Type 35 (company’s most successful race car till date) while the center console is worked with carbon-fiber depicting it dark black with gleam maintained. Creativity experimentation spreads its wings further and leaves marks over unique designed door panels, portraying a yellow Veyron silhouette around. Being loyal to this design we do not have exact words to sketch the beauty Bugatti presented. 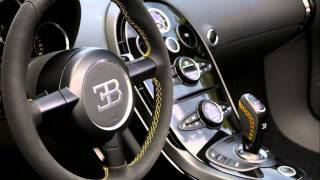 By the end rounding up the entire interior of Bugatti Veyron Grand Sport Vitesse 1of1 2014 we would just say, this is the best ever interior work done by Bugatti. 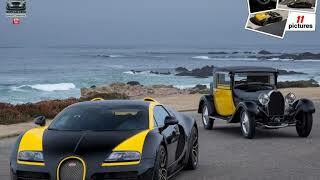 Exterior of Bugatti Veyron Grand Sport Vitesse 1of1 2014 is an unmatched amalgamation of tradition and future. 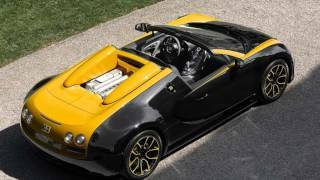 Carrying the same Yellow and black color works Bugatti has sincerely paid tribute to its legendary models marked in history like Type 44, Type 41 Royale etc. Starting with the front fascia first thing you’ll notice is its unique grille which portrays its privileged customer’s initials. Oil cap, fuel flap and wheel center caps get yellow finishing while the front fenders and hood gets adored with yellow. Moving towards the rear you’ll notice the same yellow color work over almost entire rear fascia and also the roof. Bugatti Veyron Grand Sport Vitesse 1of1 2014 carries its standard engine but with more power to mark the eternal glory of model. It is powered by 8.0 Liter W-16 engine which now delivers total output of 1183 hp and peak torque of 1500 paired to seven-speed DSG sequential transmission. With this whooping power moving all across in the veins of this beast, it is capable of finishing the 0-60 mph sprint in just 2.6 seconds while top speed touches astonishing 253 mph. Just for the sake of additional information for you, this model with its top speed has embarked its name in the Guinness Book record as fastest car in automotive industry. 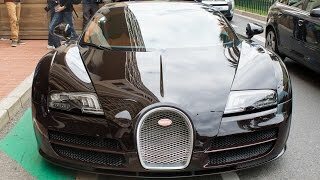 We understand you are curious to know the price of Bugatti Veyron Grand Sport Vitesse 1of1 2014, but being frank nothing has been revealed by either Bugatti or the wealthy Singapore owner, for whom they created it. So let us sit back and keep this in our dream diary.